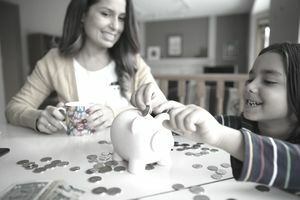 Regardless of how young your children are, it’s never too early to start teaching them how to manage their money. Here are tips to help you teach children ages 3 to 6 about budgeting their allowance. Each day or each week when the child gets his allowance, help him decide how much money he wants to put in each jar. Explain to your child that the “Saving” jar is for things that he might want to buy in the future, things that cost more than his weekly allowance. If your child has a specific goal in mind, like a new video game, you might want to attach a picture of that goal to the jar. This will help your child visualize the reason he's saving. A good example of a savings goal for a child this age might be a board game, a puzzle, a stuffed animal, or a doll. Most of these cost less than $20, which means that a child could reasonably save for it in a few weeks or a month, while still indulging in the occasional $1.50 candy bar. Remember that at this age, one week feels like an eternity. Don’t set saving goals that are too far into the future. Six months might not sound like a long time to an adult, but it feels like forever to a child. A 1-3 month time frame is reasonable for a child. You may even consider setting up multiple savings jars, each with different time frames. A smaller item, like a $10 set of Legos, might be in the “two-week” jar, while a larger or more expensive item, like an electronic game, might be in a “two-month” jar. If you set up multiple “Savings” jars, attach a photo or drawing of the desired item to each jar. Your child will visualize how he is making progress toward getting each of these various toys. Your child will also be able to understand the trade-offs between one goal and another: every dollar that he contributes towards his Legos jar is one dollar less that he can contribute towards his electronic game jar. If your child complains that “there’s never enough money” to buy all of the things he wants, encourage him to prioritize his shopping list. Phrase it as a series of simple questions: what does he want the most? What does he want the second most? You can also offer your child the opportunity to tackle additional chores around the house for the sake of earning extra money. By doing this, your child will see the relationship between work and income. Finally, let’s not forget the “Sharing” jar. Ask your child to think about people, animals, or causes that she wants to support. Suggest ideas that align with your child's natural interests. If your child loves animals, for example, take your child to a local shelter and ask your child if he wants to contribute part of his allowance to feeding the stray dogs and cats. Many money experts say that you shouldn’t force your child to share the money; the enthusiasm has to come from him. Encourage your child to share, but let it be his decision.